MassRoots (MSRT) is emerging as a major player in the increasingly competitive technology cannabis space. The company’s tracking app helps customers find cannabis dispensaries, and since its launch in July 2013 has already been downloaded by 1.3 million consumers. 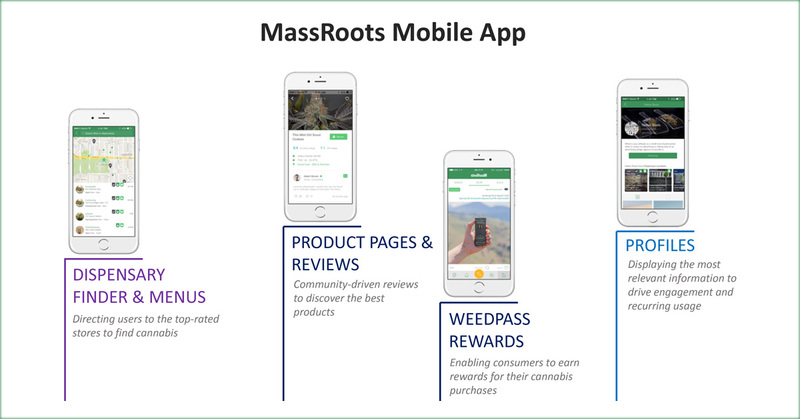 While other cannabis tech companies offer similar services, MassRoots’ new rewards and referrals program is quickly distinguishing it from competitors. The company is also strengthening its social media reach and has amassed nearly 500,000 Facebook followers and 410,000 Instagram fans. MassRoots recently announced its plans to acquire COWA Science Corporation, a privately owned company specializing in the cannabis supply chain with January 2019 sales orders exceeding $275,000 and revenues of $1.5 million in 2018. While the acquisition of COWA is contingent on the company reaching certain milestones, MassRoots founder and CEO Isaac Dietrich, stated in a recent interview SmallCapVoice.com that he is optimistic about the future with COWA. By controlling that supply chain, COWA offers its clients an opportunity to focus on growing their core business rather than getting tangled in the intricacies behind distribution. The company helps small operators compete on a larger scale by combining their purchasing power on a larger network. Ultimately, MSRT wants to both create and expand existing cannabis markets. Find out more below about how they’re setting the building bricks in place to hit the ground running tomorrow. MassRoots partners with operators but is not dependent on them. The company understands where the cannabis market is headed based on consumer demand and preliminary industry data. Due to factors like the marketplace becoming more saturated, the wholesale price of cannabis is expected to drop. We’re already seeing this trend in markets like Colorado, where legalization was passed years ago. Taking this into consideration, MassRoots is looking at the bigger picture of the cannabis industry and has chosen to leverage the cannabis audience for a much larger purpose. One of the more striking features of MassRoots is the experience of its company leaders. Dietrich may have gotten his original start in political campaigning, but his entrepreneurial spirit called him to the cannabis market after seeing powerful trends play out across the United States. After raising money to launch MassRoots, Dietrich put together a team of professionals that would complement his leadership style and raise the company to new echelons. Today, Dietrich is joined by Chief Technology Officer Chris Alameddin, former CEO of COWA. Trained as a physicist and chemist, Alameddin understands how the larger cannabis supply chain determines the individual operator’s revenue and how this can benefit MassRoots. MassRoots’ leadership team also includes Robert Hymers, a CPA with expertise in the cannabis space. He is being brought onboard to help the company refine its business model and ensure the company follows all regulation guidelines. Hymers was previously CFO of the Marijuana Company of America Inc. and has been instrumental in MassRoots’ process of acquiring COWA. Just under 9,400 active licenses for cannabis businesses in this country, according to Cannabiz Media, and these businesses need local leadership to maintain their licenses. Partnering with these local stores provides MassRoots untold opportunities to streamline everything from its marketing to the supply chain. Right now, the company is setting up the pins in the first half of 2019 to knock them down in the latter half. Dietrich knows that his company’s success lies in preparing for the future. From company registration to audits, the team is putting all of its paperwork and financials in order so there are no surprises down the line. In addition, MassRoots has also partnered with Snipp, one of the largest providers of consumer rewards. As the travel and financial industries have seen, customer rewards are an excellent way to both encourage spending and to increase loyalty to a brand. To this accord, MassRoots is revamping its app to offer fun rewards like concert tickets and other cannabis-related products to its customers. As the company looks ahead, it expects the COWA acquisition will boost its monthly revenue stream to new heights. MassRoots sees itself branching out to more dispensaries in new states like Florida and New Jersey. As more and more states become accepting of recreational cannabis use, MassRoots is poised to help both the operators and the customers find each other. PrevPreviousIsaac Dietrich, Chief Executive Officer of MassRoots, Inc., Discusses COWA Science Corporation Acquisition and Other Recent Events in an Exclusive New Audio Interview at SmallCapVoice.com, Inc.